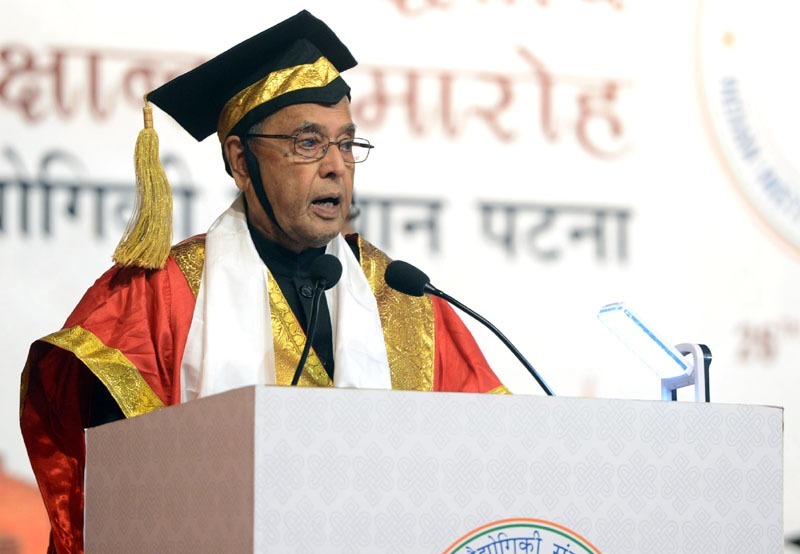 The President of India, Shri Pranab Mukherjee addressed the 2nd Convocation of Indian Institute of Technology Patna on October 26, 2013. Speaking on the occasion, the President said a renewed focus by our engineering institutions towards courses on entrepreneurship is essential for the progress of our nation. One should not only be a job seeker but also a job creator. It is perhaps a kind of commitment to oneself, to one’s abilities, to one’s persistence and of course to one’s performance. He said that he was glad to know that IIT Patna is conducting intensive course on Entrepreneurship for its undergraduate students and is proactively nursing their creativity via a dedicated innovation centre. In times to come, it should leverage this opportunity and design engineering programmes in a manner that will become a model for others to emulate. The President stated that he has been repeatedly stressing on the fact that no Indian University is ranked among the top 200 Universities of the world. This is unfortunate as we have the talent, outstanding faculty and brilliant students. He said that we must improve the quality of education and use technological options available to increase the reach of education. The President said that we need to focus our attention on Information and Communication Technology (ICT)-based learning. This plays a dual role of increasing the reach of education as well as enhancing the learning experience of students. He said that he was sure that IIT Patna would develop facilities in this regard further. He said that we must stress on research and innovation. Facilities of Internet, mobile telephony, e-medicine and e-education have brought about a sea change in the societies around the world. The President said that alumni have an important role in the growth of leading universities across the world such as MIT and Harvard. He hoped that the students of IIT Patna who are graduating out of this Institute would associate with their Alma Mater and contribute to it's development in a meaningful and significant way in future. Also present on the occasion were Dr. D. Y. Patil, Governor of Bihar and Shri Nitish Kumar, Chief Minister of Bihar.